It is well into the tripple digits where we are in the Southern USA and our Bichon Luna is panting all the time even though we keep the house a cool 70 degrees. Luna sure has the begging turned up when we are eagerly in need of relief by way of snacking on ice cream and popsicles. We have been fortunate in finding some pretty good watermelon lately and keep it ice cold in the fridge and have been enjoying some wedges lately and sharing them with Luna. Although dogs are not able to eat all fruits that we humans eat they are able to consume a lot and really enjoy them especially if they are chilled during the hot summer months. 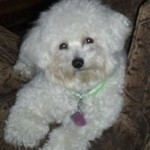 Dogsuite has a good article about what fruits to give and what fruits to avoid giving our Bichon Frise dogs. Some fruits are actually recommended as treats for dogs by vets and are even now used in high quality treats given to dogs. Below are the fruits that offer the most benefits for your dog’s health. Apples are high in carotenes and pectin. Pectin is a gel forming fiber and can improve the intestinal muscle’s ability to push waste through. Pectin also helps find and eliminate toxins. 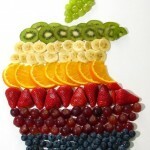 Apples are also high in essential vitamins like beta carotene, vitamin C and B complex vitamins. Although the apples should not be peeled, they should be washed thoroughly, and it’s important to make sure all of the seeds are removed from the slices fed to dogs. Pears are another good source of water soluble fiber for dogs. Pears help to tone the intestines and also contain potassium which has many health benefits for dogs. Pears are also high in vitamin C.
Oranges work to strengthen a dog’s immune system in the same way they help to enhance the human immune system. Oranges should only be given to dogs in small amounts, such as a couple of segments, due to their acid. Oranges also offer other basic nutrients that are very beneficial for dogs. Although most fruits are harmless to dogs, some can be toxic and even deadly. Certain fruits have toxic effects on the blood of dogs, especially the seeds of certain fruits. Below are the fruits that should always be avoided with dogs. Grapes and raisins are known to cause kidney failure in many dogs. All dog owners should avoid grapes and raisins completely to be safe. Cherries, apricots and similar fruits should be avoided. The seeds and pits of these fruits contain cyanide which is deadly to humans and dogs. However, dogs don’t know better than to avoid the seeds, and due to the drastic size difference for most dogs, can even be deadly. Tomatoes have been known to cause tremors and heart arrythmias for some dogs and should be avoided. Avocado fruit is toxic to all dogs. Avocado (not just the pit but also the fruit and plants themselves) can cause difficulty breathing and fluid accumulation in the chest, abdomen and heart.